I lift my hands in worship to You Lord for You are so awesome. You reign on high and I adore You. I pour out my heart Heavenly Father for a special outpouring of Your blessings upon the lives of my children. You promised me Abba, that if I bring up my children in the right way they will honor You. At this time, I feel that they have turned completely from You and Your Word. So today, I look to You for Hope and Encouragement. Proverbs 22:6 – Train up a child in the way he should go. And when he is old he will not depart from it. Father God, You are the Living God of opportunities and are filled with promises. I constantly expect to see good things happen in my children’s lives. But my expectations are soon dashed by what I see happening to them. I know that they can overcome every obstacle once they refuse to give up because the Spirit of God lives in them. Isaiah 54:13 – All your children shall be taught by the Lord , and great shall be the peace of your children. Almighty God, it is my prayer, as I intercede on their behalf and stand in faith, that this is their season. They will begin to walk in righteousness and see new opportunities flooding their hearts and minds. Rivers of living water will flow through them, exposing the awesome wonder of Who You really are. The power and peace that will overtake them will have them wanting more of You. 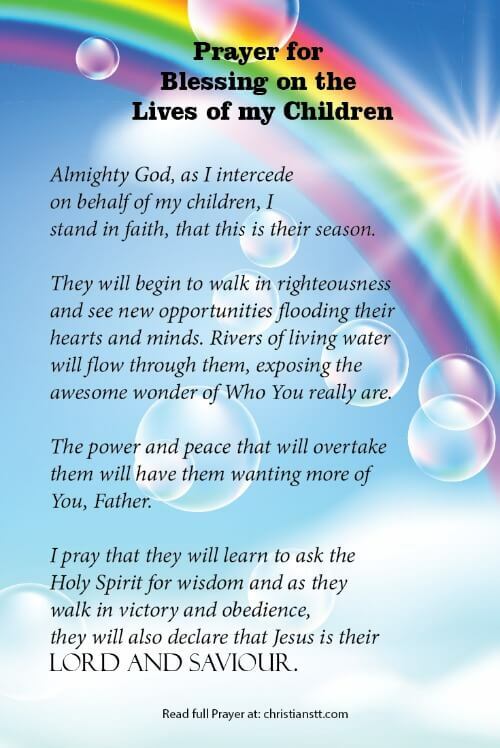 I pray that they will learn to ask the Holy Spirit for wisdom and as they walk in victory and obedience, they will also declare that Jesus is their Lord and Saviour. Colossians 2:6-7 – As you therefore have received Christ Jesus the Lord, so walk in Him, rooted and built up in Him and established in the faith, as you have been taught, abounding in it with thanksgiving. As a mother who stand on Your promises, I pray these mercies upon the lives of my children. I declare success, health, strength and prosperity over them. In the mighty and matchless name of Jesus Christ, SO BE IT… Amen. Acts 2:17 – And it shall come to pass in the last days, says God, That I will pour out of My Spirit on all flesh; Your sons and your daughters shall prophesy, Your young men shall see visions, Your old men shall dream dreams.